I have photographed this scene or something very much like it several times over. I’ve mentioned in earlier posts that, like many, I like to visit and photograph coastal locations. No doubt childhood memories play a part in this – going to the seaside was the major treat of the year, and that frisson of pleasure and ill-defined feeling of something slightly magical afoot never quite leaves me – but I also find the stuff of seaside towns fascinating in its own right: the structures and architecture that only occur by the sea and because of the sea. 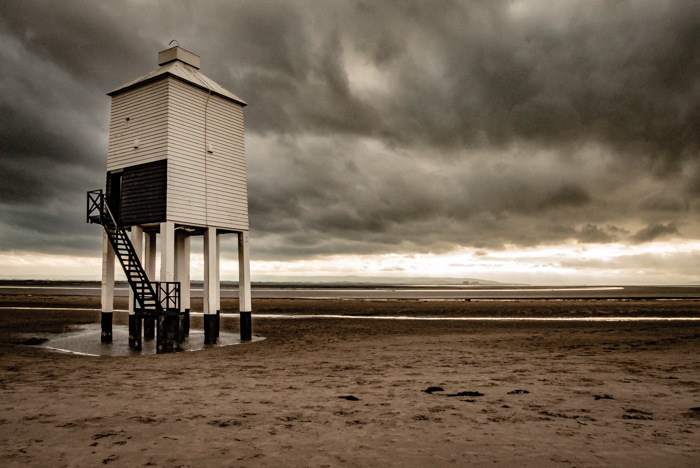 Here is a case in point: the Low Lighthouse in Burnham-on-Sea, Somerset, UK. Its location is, of course, defined by its purpose: to send a message out seaward. But the way is has been made – standing on stilts that lift it above the tide – mean that its appearance is of a kind you would not find in any location but one like this. Then there are the site specifics. There are numerous different kinds of lighthouse architecture, but the good burghers of Burnham chose this unusual construction as the right balance between cost and practicability. Clearly this is a much more delicate building than some, one that would not last too long in a location like Eddystone. On the day this was taken, a blanket of dark, ominous cloud hung over the town and stretched out to the horizon, though the threatened rain never came. Nevertheless, it was the feeling engendered by that dark cloud layer that seemed to characterise the scene and that was what I chose to bring out in the composition and the editing process. For those who like to read deeper messages into things, in the distance and in the location the clouds appear to be running to (or from) is Hinkley Point nuclear power station.